Our ladies and guys stainless steel 6oz hip flasks are designed, printed and hand applied in South Carolina. Flasks are wrapped in high quality long, lasting vinyl and guaranteed to please this holiday season. Perfect for stocking stuffers! 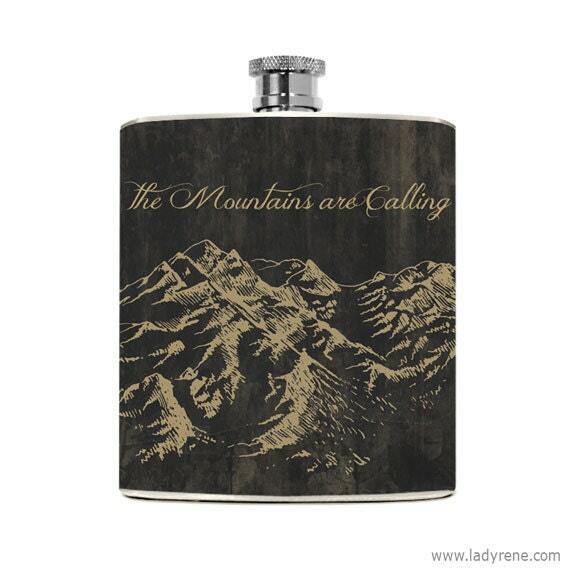 This hip flask features a classy mountain graphic with "The mountains are calling". You may choose to change the phrase on the front of the flask –leave it off completely or keep it and add a name or initials. Our hip flasks fit easily into a pocket or purse. A stylish men's or women's drinking gift to take to the bar or out on a long trek to your favorite mountaintop. The flask is just what I was hoping for! Communication and shipping time was extremely fast. Thank you!! Item came as described. Wish the quality was just a bit better, but you get what you pay for. Excited to give this to my husband!